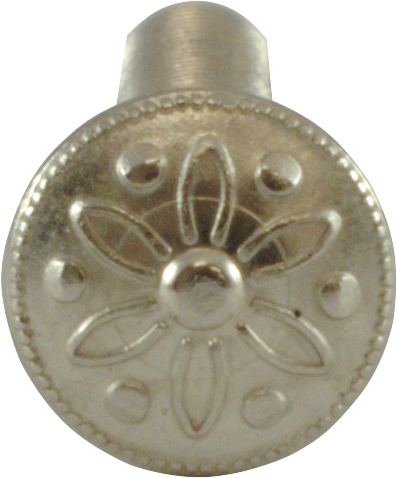 Decorative head screws, like used for speaker mounting on 1930s vintage radio cabinets. 1 ½ long. Packaging Dimensions 3.5 in. x 3 in. x 0.2 in. 1 answers What is the diameter of the head? The diameter of the head is .35"
1 answers Can a nut be tightened onto this screw? Yes, you can tighten a #8-32 nut to this screw. Just underneath the head of the screw is a knurled section that allows the screw to be held in place. 1 answers How many screws per order? These screws come in a pack of four. 1 answers Will you ever stock the same design in brass? 1 answers Do screws of this same design happen to be available in No. 10's? These are only available in one size at this time.